A flat in the Big Smoke can cost a hefty sum, forcing many Londoners to dwell in increasingly smaller spaces. However, having a more petite home doesn’t mean making do with less; by arming yourself with the right storage know-how, soon you’ll be making use of every nook and cranny. 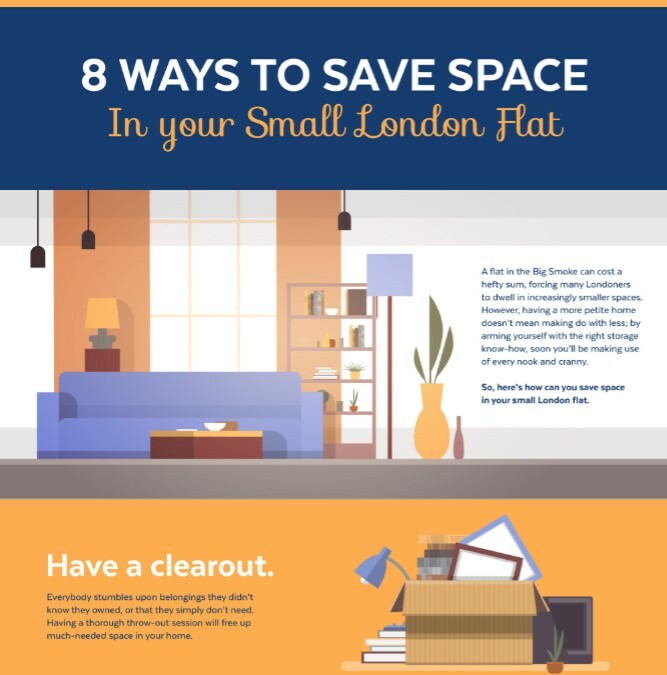 So, here’s how can you save space in your small London flat. Have a clearout. Everybody stumbles upon belongings they didn’t know they owned, or that they simply don’t need. Having a thorough throw-out session will free up much-needed space in your home. Use vertical surfaces smartly. Don’t overlook your walls and doors. They are perfect for the installation of shelving, baskets, or hooks to store away items that need to be within easy reaching distance. Bins, baskets and shoe holders. Contain your odds and ends in one place by using stylish baskets or bins which can be slotted on shelves or in cupboards. Shoe holders are cheap and easily hung, providing numerous pockets for smaller knick-knacks. Avoid oversized furniture. If there are only one or two people living in your flat, a huge sofa suite won’t be necessary. Instead, why not consider a couple of cosy armchairs or a smaller, quainter sofa? Optical illusions. Try a few tricks to create an illusion of space. Staggered shelves tapering away to the ceiling can conjure a sense of depth for a room. Adding mirrors can also trick the eye into thinking a room is larger than it actually is. Hide your storage. No matter how well-organised your storage is, it doesn’t always have to be on show. Curtains or hung fabrics can obscure shelves and drawers to create a cleaner, less cluttered look. Multi-purpose furniture. A neat trick when furnishing your home is to purchase items that serve more than one purpose, such as sofa-beds, and chairs and tables with pull-out drawers. Self-storage: No matter how space-savvy you become, fitting everything into your modest apartment may still be a chore. Self-storage facilities take the burden off your shoulders, providing a safe, monitored space for seasonal items, sports equipment, and family heirlooms. Self-storage in London couldn’t be easier than with the services of Vanguard. As a family run firm with 50 years’ experience under our belt, you can trust us to provide secure self-storage facilities, all available at competitive rates. Free up some space and get in touch today to find out more.